This document is a technical summary of the unpublished Federal Highway Administration (FHWA) report, Influence of Differential Deflection on Staged Construction Deck-Level Connections, available through the National Technical Information Service (NTIS) at www.ntis.gov. The objective of this research project was to determine the impact of differential movement across a staged construction connection. Specifically, the research investigated the bond strength of reinforcing bars embedded within freshly cast connection grouts as impacted by differential movement of the rebar with respect to the embedment material. Rapid construction methods help prevent traffic delays and minimize inconveniences to the traveling public. Many new methods have been investigated and implemented using precast concrete subassemblies on bridges. These methods have shown great promise, partly because precast components can be produced with high quality control in precast plants, resulting in superior products that allow for expedited construction schedules. Owners continue to investigate and advance their respective bridge programs through the use of precast products such as precast bulb tees, full-depth precast bridge decks, and box beams. The most critical field construction process for precast subassemblies is the completion of the connections. Long-term performance problems have developed in connections on past projects. These performance problems have been attributed to a variety of causes, including construction techniques, materials, and poor designs. Much attention has been placed on creating better connections between the components. One area of concern is the process of completing connections while portions of the bridge remain under traffic loads. This is frequently referred to as staged construction. The traffic loading causes deflections on portions of the bridge, potentially resulting in significant differential deflections across the connections that join construction stages. For connections that contain discrete reinforcement, degraded performance may result from differential deflection-induced bond degradation between the reinforcement and the embedment material. A conceptual illustration of deck-level differential deflection across a staged construction connection is shown in figure 1. Figure 1. Illustration. Differential deflection at a closure pour. This research effort studied the impact of differential deflections across staged construction connections. The size, frequency, and duration of the deflections are all factors of concern. Many types of grout materials have been proposed for use in these field-cast connections, and differential deflections may affect each one differently. The goal is to understand how the bond between the rebar and the grout material changes due to movements that occur during the curing process. The testing program focused on the pull-out behavior of steel reinforcing bars cast into grouts that might be used in prefabricated bridge element connections. 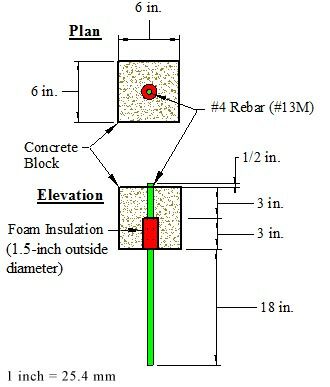 The implemented test method, which included 6-inch cube pull-out specimens with #4 (#13 metric (M)) rebar, was built on the ASTM C234-91a standard. (1) Differential deflections were imparted that ranged from 0.1 to 0.005 inches (0.254 to 0.0127 cm) of linear bar movement perpendicular to the bar axis. The deflections were applied to the cube molds while the rebar was fixed in place. The deflections were imparted periodically at 30-s intervals and continued from casting until the final set of grout. A range of different grout materials were engaged in this research program. These included standard conventional grouts, deck concretes, ultra-high performance concretes (UHPCs), epoxy grout, magnesium phosphate grout, and cable grout. After the final set, the cubes were allowed to cure until approximately 24 h after casting, at which point they were tested. A series of control cubes were also cast and tested for pull-out resistance. These control cubes remained stationary during curing. The pull-out tests were completed on sets of six specimens, with three having been deflected during curing and three serving as the non-deflected control specimens. A bond breaker between the bar and the grout allowed the test to assess only the bond of the bar to the grout in the portion of the specimen between 3 and 6 inches (76 and 152 mm) from the location where the bar entered the specimen. The pull-out specimen geometry is illustrated in figure 2. The uniaxial tensile load was applied to the bar, and the force was resisted by the face of the grout cube through which the bar passed. The pull-out response was captured, and comparisons were made between the sets of specimens. Primary comparisons focused on the impact of deflection amplitude and type of grout on the overall pull-out performance. Figure 2. Illustration. Pull-out test specimen geometry. From the perspective of the pure bond strength, deflecting the rebar prior to the final set of the embedment material can have a detrimental effect on the bond. When the rebar deflected 0.05 inches (1.27 mm) or more, reduced bond capacity was observed. Deflections of 0.01 inches (0.25 mm) or less created only small changes in the bond strength. Tests aimed at assessing the impact of varying the rate of deflection (i.e., the deflection frequency) did not demonstrate any appreciable difference in performance. Deflection frequencies of 2 and 5 Hz were assessed. The test method proved to be an appropriate mechanism through which to assess the impact of differential deflection during staged construction on the bond performance of a rebar to field-cast grout. The specimen geometry and loading protocols allowed the majority of test specimens to fail in a pull-out mode, thus providing an indication of the pull-out resistance of the bond. The lone exceptions to this observation were the epoxy grout, UHPC, and magnesium phosphate grout when subjected to 0.01 inches (0.25 mm) of differential deflection. The magnesium phosphate grout exhibited splitting failures. This type of failure is the result of a low tensile strength in relation to the local bond interaction between the bar and the grout. For materials of this type, modification of the testing protocols may be necessary. The epoxy grout and UHPC produced rebar tensile failures. For specimens producing this type of failure, either a shorter bond length or earlier testing at a lower compressive strength may be appropriate. The companion static tests provided an indication of the relative bond strength of each grouting material. The epoxy grout and UHPC displayed the highest static bond strengths. With 3-inch (76-mm) embedment, #4 (#13M) rebar cast into these grouts ruptured at the rebar ultimate tensile capacity. The compressive strengths of these grouts at the time of pull-out testing were approximately 12 and 14 ksi (83 and 96 MPa), respectively. Identical tests on conventional grouts resulted in pull-out mode failures at less than half of the rebar rupture load. Differential deflection across a staged construction field-cast connection can have a detrimental impact on the performance of the connection. This study investigated the bond of #4 (#13M) reinforcing bars and found that differential deflections equal to or greater than 0.05 inches (1.27 mm) caused a reduction in the bond strength. Not surprisingly, differential deflections seemed to ream a hole in the embedment material around the reinforcing bar, thus reducing the bond capacity. Although not studied in this project, movements along more than one axis may have an even greater impact on the bond performance of the reinforcement. The grouts investigated in this study displayed a range of bond strengths. Grouts with higher bond strengths may provide appropriate performance even after being subjected to differential deflections. The overall system performance is highly dependent on the specific details of the connection design and the reserve capacity provided therein. Differential deflections are highly dependent on a bridge’s structural configuration, the lateral load distribution system, and the locations of the applied loadings. Individuals associated with projects of this type are advised to carefully consider the staging process and the impacts that it might have on the structural performance of the bridge system. Reducing structural live loadings, increasing the stiffness of the superstructure load distribution system, and/or detailing the connections to exhibit reserve capacity may be appropriate remedies to address this issue. ASTM C234-91a. (1991). ”Standard Test Method for Comparing Concretes on the Basis of the Bond Developed with Reinforcing Steel,” ASTM Book of Standards, ASTM International, West Conshokocken, PA.
Researchers—This study was directed by Ben Graybeal at FHWA’s Turner-Fairbank Highway Research Center. Additional information can be gained by contacting him at (202) 493‑3122 or in the FHWA Office of Infrastructure Research and Development located at 6300 Georgetown Pike, McLean, VA 22101-2296. Key Words—Prefabricated bridge elements and systems (PBES), Staged construction, Differential deflection, Reinforcing bar bond, Connection details, Pull-out resistance. Keywords: research, infrastructure, structures, Prefabricated bridge elements and systems (PBES), Staged construction, Differential deflection, Reinforcing bar bond, Connection details, Pull-out resistance.